In 2005, our laboratory started a grass-roots project by generating and characterizing the molecular tools needed to rigorously study the pannexin gene family that consists of only three members (Panx1, Panx2 and Panx3). Through these seminal efforts we have contributed extensively to the biochemical characterization, post-translational modifications, and trafficking of pannexins. Further studies have led to an understanding of pannexins as channel forming proteins involved in many functions including keratinocyte and mammary gland differentiation, and cancer. We are particularly interested in the life cycle of pannexins from their synthesis, delivery and cell surface dynamics to internalization and degradation. We use live-cell imaging technologies and fluorescence recovery after photobleaching to examine the mobility of fluorescent protein-tagged pannexins at the cell surface and during transit to or from the cell surface. We are investigating how pannexins acquire different intracellular residencies in both polar and non-polar cells as we propose this will ultimately dictate their functional role. We are also keenly interested to know what roles pannexins play in bone and cartilage development and differentiation as we have previously shown that Panx3 ablation protects against surgically-induced osteoarthritis. These studies are aided by the fact that we have global Panx1 and Panx3 knockout mice at our disposal. N.M. Novielli-Kuntz, M. Jelen, K. Barr, L.J. DeLalio, Q. Feng, B.E. Isakson, R.Gros and D.W. Laird (2019) "Ablation of both Cx40 and Panx1 results in similar cardiovascular phenotypes exhibited in Cx40 knockout mice". Bioscience Reports 39: doi:101042/bsr20182350. J.L. Esseltine and D.W. Laird (2016) "Next-Generation Connexin and Pannexin Cell Biology" Trends in Cell Biology 26: 944-955. J.M. Abitbol, J.J. Kelly, K. Barr, A.L Schormans, D.W. Laird and B.L Allman (2016) "Differential effects of pannexins on noise-induced hearing loss" Biochemical Journal 473: 4665-4680. D. Caskenette, S. Penuela, V. Lee, K. Barr, F. Beier, D.W. Laird* and K.E. Willmore* (2016) “Global deletion of Panx3 produces multiple phenotypic effects in mouse humeri and femora” Journal of Anatomy 228: 746-756. *Co-corresponding authors. S. Penuela, J.J. Kelly, J.M. Churko, K. Barr, A.C. Berger and D.W. Laird (2014) “Panx1 regulates cellular properties of keratinocytes and dermal fibroblasts in skin development and wound healing” Journal of Investigative Dermatology 134: 2026-2035. S. Penuela, A. Lohman, W. Lai, L. Gyenis, D.W. Litchfield, B. Isakson and D.W. Laird (2014) “Diverse post-translational modifications of the pannexin family of channel-forming proteins" Channels 8:124-130. 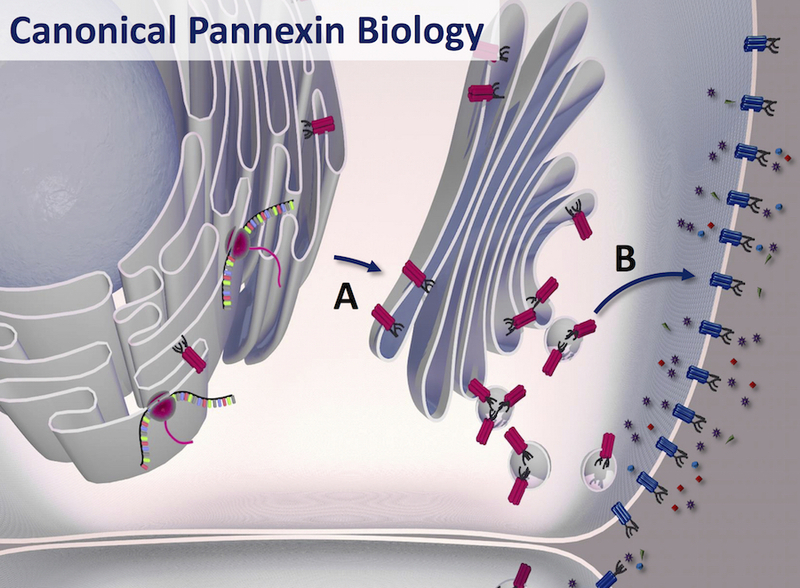 S. Penuela, R. Gehi and D.W. Laird (2013) “The biochemistry and function of pannexin channels” BBA-Biomembranes 1828:15-22. S. Penuela, L. Gyenis, A. Ablack, J. Churko, A. Berger, D.W. Litchfield, J.D. Lewis and D.W. Laird (2012) “Loss of pannexin1 attenuates melanoma progression by reversion to a melanocytic phenotype” Journal of Biological Chemistry 287: 29184-29193. Highlight in press releases by CTV News, Western Research and the London Free Press. R. Gehi, Q. Shao, D.W. Laird (2011) “Pathways regulating the trafficking and turnover of Pannexin1 and the role of the carboxyl terminal domains” Journal of Biological Chemistry 286: 27639-27653. R. Bhalla-Gehi, S. Penuela, J.M. Churko, Q. Shao and D.W. Laird (2010) “Pannexin1 and Pannexin3 delivery, cell surface dynamics and cytoskeletal interactions” Journal of Biological Chemistry 285: 9147-9160. S.J. Celetti, K.N. Cowan, S. Penuela, Q. Shao and D.W. Laird (2010) “Implications of pannexin 1 and Pannexin 3 for keratinocyte differentiation” Journal of Cell Science 123: 1363-1372.